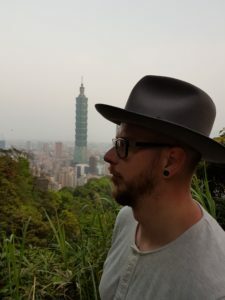 I am Matthias Hampel, born and raised in Germany, but since 4 years I am living in Asia. First I lived in China, but in 2016 I moved to Taiwan. I work for a German chemical company, and taking care of their Asia business. Which style are you wearing from Butts and Shoulders? 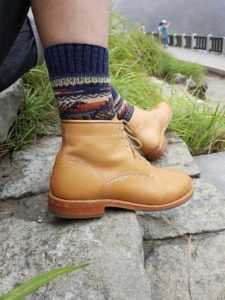 I am wearing The Natural Classic Boots. What do you like the most on our product? Here in Taiwan we have quite high temperatures during the year. And for Europeans like me, that climate can be quite challenging, especially through summer. But of course a real boot addict like me, still need to wear boots then. 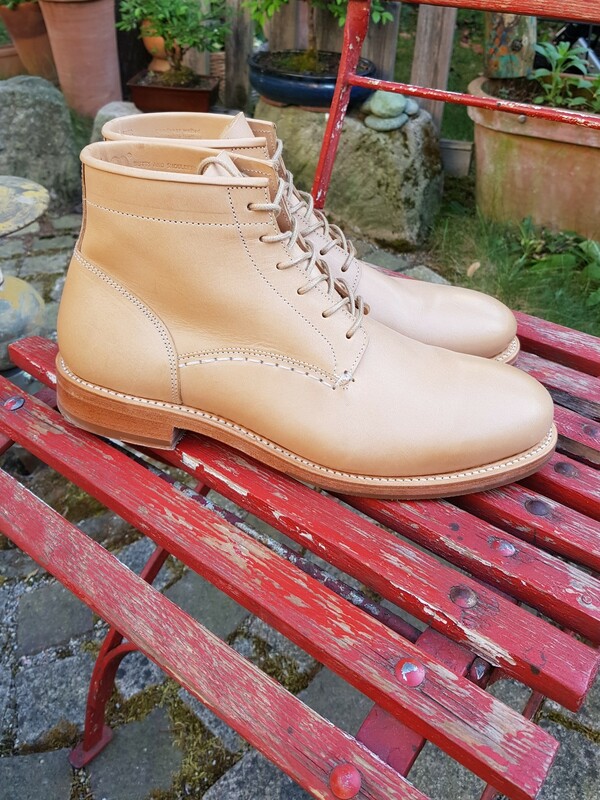 The Butts and Shoulders boots are really suitable for summer weather. They are light, but still sturdy. Compared to all my other boots, these are real featherweights. And of course I love the vegetable tanned leather. The idea of creating your own unique pair of boots is just awesome. And the only thing needed, to achieve this, just wear the heck out of them. Of course the quality is top notch. Superb material and a flawless stitching. And I am getting a lot of compliments on my boots. Which brands do you wear (or using) next to ours? Denimwise, I mainly wear Blaumann Jeanshosen and Pure Blue Japan. The rest of my wardrobe is genuinely mixed. Merz beim Schwanen, Nigel Cabourn, Fleurs de Bagnes, Aeroleather. But I also love vintage miliatry clothing especially from the German and Swedish Military. 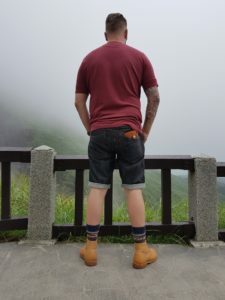 Recently I discovered a new brand for me here in Taiwan – JEANSDA. They are doing great stuff and also having a nice shop here in Taipei. What is your favorite store to shop and why? I like to shop at Kings & Bastards. Uwe (the owner) is offering a great variety of heritage and workwear inspired mensclothing. Everytime, when I go back to Germany to see family and friends, I will also visit Kings & Bastards. It´s always nice to have a chat with Uwe and take a look at new products. It´s really a mens paradise shop. You can basically find everything from denim, leatherjackets, shirts, belts to socks and underwear. What’s your favorite city to visit for a weekend trip and why? As I live in Asia, my favourite city in Asia is definitley Taipei. Taipei is a very versatile City with a great art and culture heritage. There is also a great Denim and Vintage culture, second hand shops, small trade shows and exhibtions. It’s great to go shopping in all the small unique shops in Daan district. In Europe, my favourite City is Munich. A great mixture of tradition and modern life. And of course, they have great beer over there. Do you have a favorite denim brand? My favourite denim brands are Blaumann Jeanshosen and Pure Blue Japan. These also reflects, that I am German, but live in Asia. Blaumann combines Japanese Fabric, which is processed in Germany. My Inspiration is influenced by European and Asian denim culture – even they love the same, their style is different. I love to combine both styles, with other inspirations I have got during my travels. I have travelled a lot and thats probably what influenced me most. How much time do you spend on social media? And do you create your own content? Probably around 1 to 2 hours per day. Honestly I am not really paying attention to have a schedule for creating and posting content. I just use this as a valve to compensate the stress of work. Whenever I like to snap a pic, I’ll do it never sure, if I post it or not. If you empty your pockets what do we see? Cellphone, keys and a folding knife. What’s your favorite inspiration quote? I don’t really have an inspiratinal qoute – but I always say “ALLES WIRD GUT” what means EVERYTHING WILL BE ALRIGHT. It quite fits my personality, due to I am a positive thinkink person.